We’d love your help. 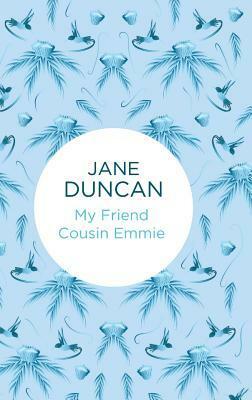 Let us know what’s wrong with this preview of My Friend Cousin Emmie by Jane Duncan. To ask other readers questions about My Friend Cousin Emmie, please sign up. I have waited too long to write this review, so it will be even more impressionistic than usual. It is a very good book, perhaps in part simply because it deals with (view spoiler)[lesbian relationships in a way which seems profoundly sensible for the period in which Duncan was writing. (hide spoiler)] But also, as always, I like the way Janet struggles to come to grips with things which are not within her sphere, and despite her hot temper and quick judgements, manages to approach other people w I have waited too long to write this review, so it will be even more impressionistic than usual. Janet and her husband Twice are headed back to the Caribbean where Twice works. In tow they have a rich but confused young woman, Dee, who wants to get away from her father. On the ship Janet is sucked into a companionship with a woman who can't seem to say anything pleasant. The woman turns out to be a cousin of the family who owns the plantation Twice works for -- Cousin Emmie. Caught between Dee and Cousin Emmie, Janet is about blowing a gasket. It would have been even worse if she wasn't abl Janet and her husband Twice are headed back to the Caribbean where Twice works. In tow they have a rich but confused young woman, Dee, who wants to get away from her father. On the ship Janet is sucked into a companionship with a woman who can't seem to say anything pleasant. The woman turns out to be a cousin of the family who owns the plantation Twice works for -- Cousin Emmie. Caught between Dee and Cousin Emmie, Janet is about blowing a gasket. It would have been even worse if she wasn't able to spend time with the charming, remarkably observant Roddy Maclean. Once they arrive home, Roddy becomes one of the sources of trouble. It is Cousin Emmie's sharp observation, when she finally decides to communicate, that straightens out Dee's problems; but no one in their community besides Janet is equipped to understand Roddy. The stinking so-called librarians at the Cary Memorial Library in Lexington have thrown away their copy. I should have stolen it when I had the chance! Only one copy left in the network.